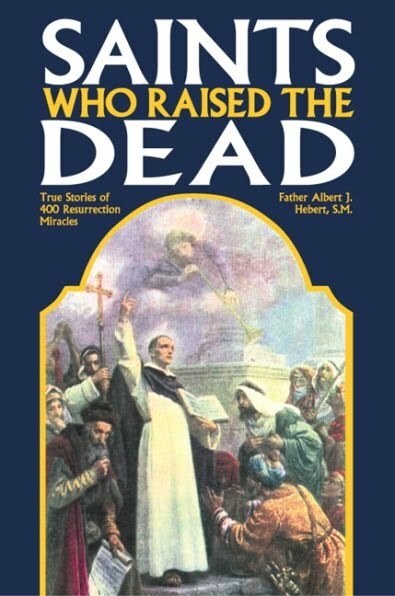 The book "Saints Who Raised The Dead" by Father Albert J. Hebert documents true stories of 400 resurrection miracles in the lives of the Saints. Jesus says to His apostles in the Gospel of John: "Amen, amen, I say to you, whoever believes in me will do the works that I do, and will do greater ones than these, because I am going to the Father. And whatever you ask in my name, I will do, so that the Father may be glorified in the Son. If you ask anything of me in my name, I will do it." 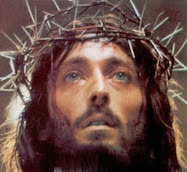 (John 14:12-13) And again He commanded His apostles: "Cure the sick, raise the dead, cleanse lepers, drive out demons. Without cost you have received; without cost you are to give." And following Jesus command, we have in the Acts of the Apostles Peter raising Tabitha from the dead (Acts 9:40), and later Paul raising Eutychus from the dead (Acts 20:12). And after the Apostles we have the Saints continuing the mission and the mandate of Jesus to "Cure the sick, raise the dead, cleanse lepers, drive out demons" and to "evangelise unto the ends of the earth." In the book, "Saints who raised the dead" there are dozens of Saints listed along with an explanation of the resurrection miracles that they performed. Some of the many listed are St Ignatius of Loyola, ST Paul of the Cross, St Catherine of Siena, St Hyacinth, St Martin of Tours, St Ambrose and many others. 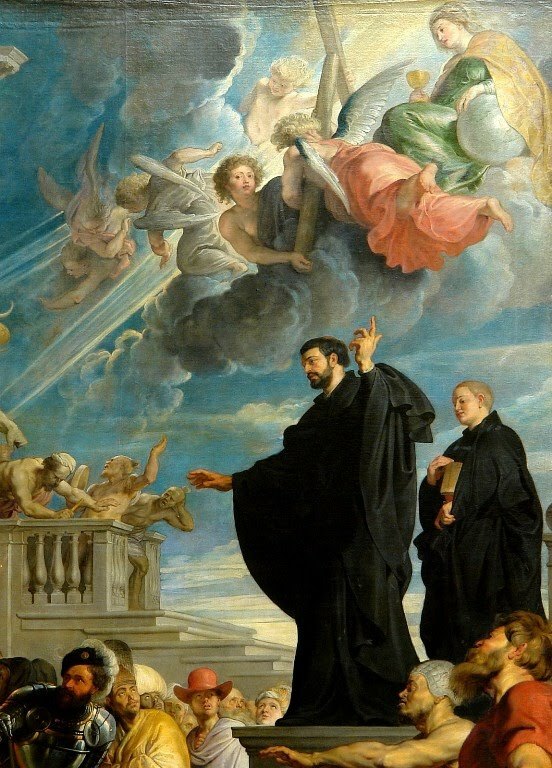 But probaly one of the greatest evangeliser and missionary Saints was St Francis Xavier. The focus of this article will be the many persons that St Francis brought back to life through the grace of God. 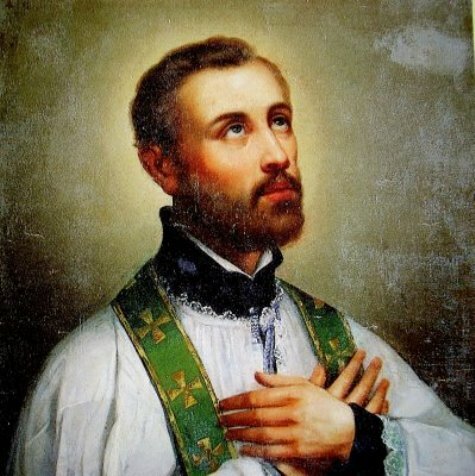 In light of his extensive evangelizing, missionary travels and hardships, the great Jesuit missionary St. Francis Xavier (1506-1552) is considered to be one of the greatest missionaries since St. Paul. He is known as the "Apostle of the Indies," and the "Apostle of Japan” for in about ten short years (1541-1552) Francis did the work of many individual missionaries, spreading the Catholic Faith from Goa (Portuguese territory in western India), over South India, Ceylon, Bengal, Cape Comorin, the Moluccas, Spice Islands, Malacca, and through the China Sea to Japan where he died-alone except for one companion, a Chinese youth named Antiry, on the Japanese island of Sancian, waiting for a ship to China. On his journeys St. Francis Xavier converted hundreds of thousands, and the impact of his work lasted for centuries. Those exotic lands were vastly different from the Basque country of his native northern Spain and the Xavier Castle on the fertile mountain slope overlooking the Aragon River. There in the Kingdom of Navarre, Francis Xavier had been born in 1506, the youngest of the six children of the Chancellor of Navarre, Don Juan de Jassu (a doctor of law), and the very beautiful Donna Maria Azpilcueta y Xavier. Francis Xavier was a brilliant and attractive personality. As a student and lecturer at the great University of Paris, he came under the influence of St. Ignatius Loyola. Francis was among the first seven to take their vows in the fledgling Society of Jesus founded by St. Ignatius; he was later the last to make the famed Spiritual Exercises of St. Ignatius. If Francis had remained in Europe and the universities he might have become famous as a great teacher or doctor of the Church, judging by the promise of his already brilliant accomplishments. At that time it came about that King John III of Portugal asked the Pope to send six members of the new society to do mission work in Asia. He wanted them to leave in the royal galleon of the Governor of Portuguese India in April, 1541. Ignatius could spare only two Jesuits, and one of them, Bobadilla, became seriously ill with a severe fever at the last minute. It was apparently with dismay on the part of both Ignatius and Francis that the latter became the substitute. Then and there the history of the Church and its missions was changed by the workings of Divine Providence. 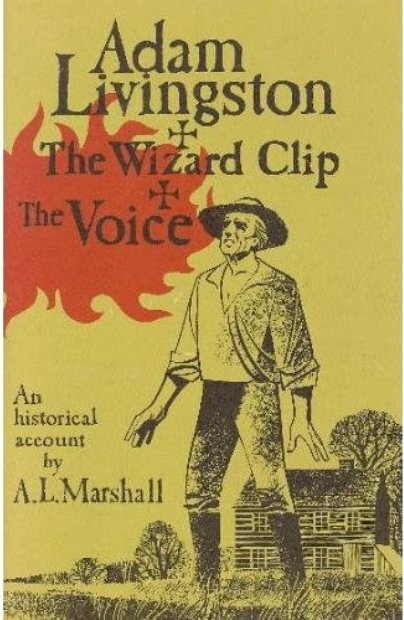 So often it seems that there is a "sacrifice of brilliant talents"; the ability to teach metaphysics in university classes and the meticulously acquired knowledge of Greek and Latin give way to the simplest form of catechism, as a missionary instructs the children, pagans, and cast-offs of many distant places, returning again to language study as he struggles with the idioms of foreign dialects. But God knows what He is about. Due to inclement weather it took the packed galleon of 900 passengers 13 months to complete its voyage. It arrived at Goa in May, the month of Mary, 1542. There St. Francis Xavier spent five months before traveling on to Cape Com-orin. In Goa he preached, cared for the sick and for prisoners, taught children, and endeavored to bring Chris¬tian morality to the Portuguese there, particularly denouncing the concubinage which was so prevalent among them. Besides his numerous cures, there were many other wonders in St. Francis' life: gifts of tongues, predictions, bilocation, calming a storm at sea, and more. Francis had been "all things to all men"; he was known and loved (and sometimes hated) by great and small in all walks of life. Perhaps the greatest wonder of all is the fact that he baptized 100,000 with his own hand. That remarkable right arm is still preserved and venerated. Along with the miracles of raising the dead, Butler speaks of four such events which occurred in one period alone, according to the canonization process. Those four resurrections were those of a catechist bitten by a venomous snake, a child drowned in a pit, and a young man and a young girl dead of pestilential fever. On the Fishery Coast, St. Francis Xavier worked enough miracles to fill a large volume. Once when he was about to begin Mass in a small church at Combutur, a crowd entered with the corpse of a boy who had been drowned in a well. His mother threw herself at the feet of St. Francis-who was also the one who had baptized this child. She implored him to restore the boy to life. Francis said a short prayer, took the dead child by the hand, and bade him arise. The child rose and immediately ran to his mother. There was a pair of youths who accompanied Francis as catechists. During the night one of them was bitten in the foot by a "cobra da capello." In the morning the youth was found dead. Francis took some saliva from his own mouth, touched the foot of the poisoned catechist, made the Sign of the Cross over him, took him by the hand and bade him arise in the Name of Jesus Christ. The youth responded immediately and was able to continue the missionary journey at once. It was as simple as if he had just gotten up from sleep, instead of having been restored to life itself. Several chroniclers attribute to St. Francis other resurrections of the dead in that part of the country. Only the Lord knows how many Francis actually recalled from the dead in all his missionary life, laboring night and day. Large numbers could be expected when one recalls that he was the greatest missionary since St. Paul, and if one considers how many of the dead have been raised by other great missionaries. Further, it is stated in the processes concerning Francis that one of the children he often sent among the sick in his name raised two dead persons to life. The Christian "children" of St. Francis worked many prodigies. One is re¬minded of the helpers St. Vincent Ferrer commissioned to continue working miracles for the multitudes during the times when the saint himself was exhausted. 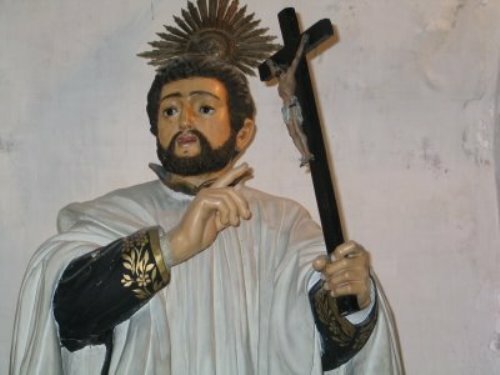 The following miracle of St. Francis Xavier is recorded in the Relatio documented in the time of Pope Paul V. In the streets of Mutan, Francis met a funeral procession bearing the body of a youth who had died of a malignant fever. Ac-cording to the custom of that area, the body had been kept for 24 hours wrapped in a shroud. Like Jesus with the widow of Naim, Francis pitied the bereaved parents; they pleaded with him. The saint knelt down, raised his eyes to Heaven, and prayed to God for the lad's life. Then he sprinkled the covered corpse with holy water and ordered the funeral shroud cut open. When the body was visible, Francis made the Sign of the Cross over it, took the youth by the hand, and bade him in the Name of Jesus to live. The youth rose up alive, and Francis gave him to his parents in good health. The crowd marveled and praised the holiness of Francis. The youth's parents and friends, in grat¬itude and memory of the deed, erected a great cross on the spot and held a festival there. 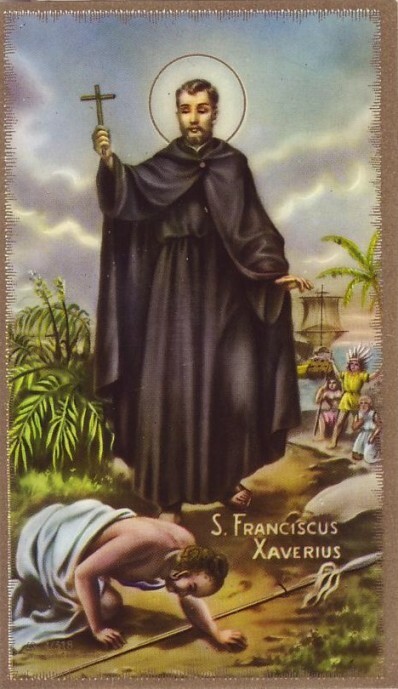 At another time, St. Francis was preaching at Coulon, near Cape Comorin in Travancore at the southern tip of India opposite Ceylon (Sri Lanka). This was a seaport, a rough town where many Christians dishonored their name. Francis, while preaching in the Portuguese church there, felt baffled and stymied by the wall of obstinacy he met in his hardhearted listeners. Now it happened that a man had been buried in the church the day before. St. Francis stopped preaching; he prayed to God to honor the Blood and the Name of His Son and to soften the hearts of the congregation. Then he directed a few men to open the nearby grave of the man who had been buried the day before. He had prayed in tears, and now he accompanied his directions with the burning words of holy eloquence. He told the congregation how God was pleased even to raise the dead in order to convert them. When they opened the tomb and brought out the body, it was already giving off a stench. On Francis' orders they tore apart the shroud-to find the body already beginning to putrefy. Francis expressed his desire that they should all take note of these facts. (They could hardly escape them!) Then the saint fell on his knees, made a short prayer, and commanded the dead man, in the Name of the Living God, to arise. The man arose-alive, vigorous and in perfect health! The onlookers were filled with awe. Those who needed it fell at the saint's feet to be baptized, and a large number of people were converted because of this miracle. The two miracles above were accepted by the auditors of the Rota as resting on incontrovertible evidence from two witnesses, Emanuel Gaga and Joam Audicondam, as well as from one "dead" person himself. These great miracles led almost the entire kingdom--except for the king and a few of his courtiers-to become Christians within a few months. And as Father Coleridge points out in his two-volume life of St. Francis Xavier, "We must take these miracles as but specimens." Why would God grant anyone the power to perform such great miracles? This becomes easier to understand when one appreciates the immense number of souls converted by St. Francis Xavier. Within about a year he had established up to 45 Christian communities in the area. It is hard to conceive of such mass conversions, whether by Francis Xavier or by any missionary apostle, without great and numerous wonders to testify to the truth of the apostle's words. Our Lord used His own miracles as signs that testified to His Messiahship and Kingdom. His wonders proved that He was, indeed, the Son of God sent by the Father. He ordered His disciples to work similar miracles with generosity, and promised that they would work even greater wonders than He had. Man is inclined to measure miracles by his own limited standards and abilities. But for God, of course, the "great" and the "small" miracle are equally easy. Yet it somehow seems more wonderful when (as with Lazarus) someone who has been dead for days is raised, rather than one who has very recently died. But death is death-whether it has lasted a minute or a week-and the wonder of restoration is equally marvelous in either case. At Malacca St. Francis Xavier worked a miracle for someone who had been buried for several days. When Fran¬cis was away from the town, the daughter of a recently baptized woman died. The mother had sought Francis everywhere while the girl was still ill. When this earnest parent learned that Francis had returned, she was full of the simple faith that Francis, whom she was convinced could have healed her daughter-as he had cured people en masse¬could just as easily raise the girl from the dead. As Martha said to Jesus, "But now also I know that whatsoever thou wilt ask of God, God will give it thee." (John 11 :22). When the mother found St. Francis she threw herself at his feet, and like Martha and Mary, exclaimed that if he had been there her daughter would not have died; nonetheless, nothing was difficult for God, and she knew that Francis, with his prayers, could return her to life. As Jesus had mar¬veled at the faith of the Roman centurion and the Syropheonician woman, St. Francis Xavier marveled at the faith and confidence of this recent convert. Since the mother seemed so worthy of such a favor, Fran¬cis prayed for God to grant her this consolation. Then he turned to the mother and told her to go to the grave; her daughter was alive. Hopeful, fearful, not disbelieving, but because Francis had not offered to come himself to the tomb, she answered simply that the girl had been three days buried. But St. Francis had measured her testing tolerance. She questioned St. Francis no further; with shining faith she ran rejoicing to the church where her daughter had been buried. At the burial place the mother, together with many other witnesses who had hurried there with her, had the stone raised from the grave. The dead daughter, buried three days, came out alive! As with the raising of Lazarus, no one could doubt the verity of such a miracle. One must admire the tenacious faith of this newly converted woman. Such strong faith is seldom found. The great faith and wisdom of the apostle met and matched the faith of the mother, when he asked her to go to the tomb alone. This power of raising the dead from a distance seems to have been a special charism of St. Francis Xavier. In Japan, at or near Cagoxima, a pagan nobleman lost his only daughter. He was greatly grieved. Some recent Christian converts, sympathizing with him, recommended that he seek help from the God of the Christians and the prayers of the "great teacher of the Portuguese." The father went to St. Francis and cast himself at his feet. He was so choked with emotion he could not speak. But the saint understood. St. Francis went into the little oratory where he offered Mass. His helper, Joam Fernandez, went along with him. After Francis prayed for a few moments he came out and told the anxious father to go, that his prayers were heard. That was all Francis said, so the nobleman turned homeward, hurt and grieved. But on his way a servant met him and joyfully told him that his daughter was alive. Next, the girl herself came run¬ning and threw herself upon her father's neck. She informed her father that when she had breathed her last breath, im-mediately two horrible demons had seized her. They were about to hurl her into Hell when two venerable men came to her rescue. The next moment she found herself alive and well. When the girl's father brought her to St. Francis Xavier's house she identified Francis and Fernandez as her two deliverers. Father and daughter were subsequently in¬structed and baptized. Another miracle occurred when Francis was on a ship, the Santa Croce, going to San Chan. A Musselman's five-year¬old son fell overboard at a time when the ship was running fast before the wind. It was impossible even to attempt to save him. The father had been in despair for three days when he chanced upon Francis on the deck. Francis somehow -for the glory of God? -had not heard of the tragedy. He asked the father if he would believe in Jesus Christ if his child were restored. (A small child, overboard in the sea for three days, miles behind the ship, and Francis confidently asks such a question!) The man said he would believe. A few hours passed, probably while Francis was praying. Suddenly the Musselman met his child, bright and joyous, running to him on the deck. The father and his entire family were baptized. "For, Amen I say to you, if you have faith as a grain of mustard seed, you shall say to this mountain, Remove from hence hither, and it shall remove; and nothing shall be im¬possible to you." (Matt. 17:19). The "mountain" may represent the great obstacle of unbelief to be overcome. A mustard seed is very, very small. Suppose one's faith were the size of a watermelon seed ... or a coconut ...? 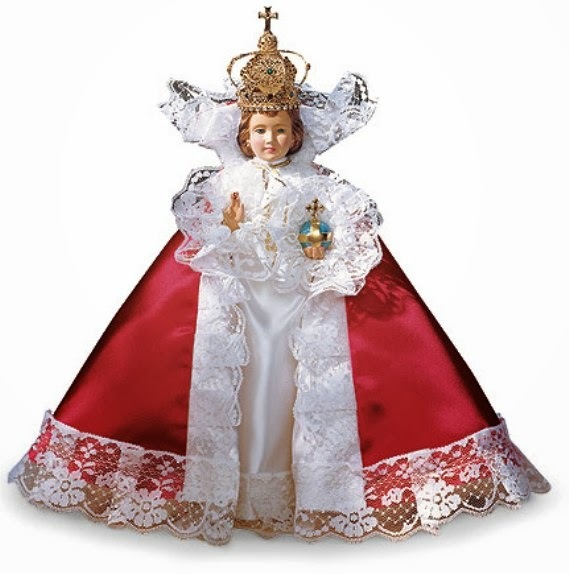 In Japan at Cagoxima, Francis blessed the swollen body of a deformed child, making it straight and beautiful. And that expresses well the objective of the saints: to make all men straight and beautiful in the eyes of God. Among his later miracles, Francis raised to life a young pagan woman "of some quality" who had been dead a whole day. At Malacca he restored to life a young man, Francis Ciavos, who later became a Jesuit. St. Francis Xavier died on December 3, 1552, at the age of 46. Before his burial, the coffin was filled with lime-two sacksfull beneath the body and two over it-in order to hasten decomposition so that at some future time the bones could be easily transported to India. Ten weeks later, when the saint's body was exhumed to be taken to Malacca, it was found to be perfectly incorrupt. Only 12 years after he had first embarked on his missionary journeys, the body of St. Francis Xavier was brought back to Goa in veritable triumph. Around the saint's body miracles were recorded every day of that autumn and winter. When his remains were temporarily placed in the chapel of the College of St. Paul on March 15, 1554, several blind were cured, as also were paralytics, those with palsy, etc. Francis had been the special envoy of both the Holy See and of King John III of Portugal; on the order of the King a verbal process was made with the utmost accuracy, in Goa and in other parts of India; in it, accounts were taken of many miracles wrought through St. Francis Xavier. Today the body of St. Francis Xavier is dry and shrunken, but there is still no corruption. Many parts of the body, notably the right arm mentioned above, have been removed and sent to various places as most precious relics. In 1974-75 the body of the saint (in a glass case) was exhibited for viewing and veneration for a six -week period. 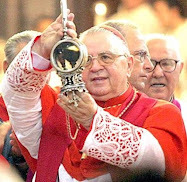 Today it rests in a silver reliquary in the Basilica of Born Jesu in Goa, India. -St Francis Xavier, pray for us! Primary source is the excellent book "Saints Who Raised The Dead -True Stories of 400 Resurrection Miracles" by Father Albert J. Hebert, S.M., Tan Books and Publishers. -Click here for an additional article on Saints Who Raised the Dead, which highlights the many extraordinary resurrection miracles of St Vincent Ferrer. SSMO FRANCISCO XAVERUS, ORA PRO NOBIS!!! VIVA SANTA IGLESIA CATOLICA! VIVA! long live roman catholic church!! long live!!! without seeing these miracles,I believe. Please intercede for me before the Throne of God for my son. God knows exactly what I'm praying for and been praying for in full unwavering faith and what this requires and what needs to get done now. Francis Xavier please pray for my family that they surrender to Lord Jesus Christ. Pray for my sister and her husband who is a hindu that they are saved and accept Jesus as their Lord and Savior. Pray for my 2 sons that they walk in the ways of the Lord. Every 10 years the casket is brought down to ground level for an exposition . I was lucky to be there in 1994. The next one will be in 2014 usually around Dec for 40 days . Pls. intercede for me and my daughter for our good health. St. Francis Xavier, please heal me and my daughter. Thank you. Saint Francis Xavier Pray for me and my family that we are real Catholics and have the faith and love that you had for the Lord. And pray for all people struggling with loss of loved ones. Saint Xavier: Please pray for my brother and heal him from all his sicknesses physically and mentally, in Jesus Name, Amen. Sain Francis Xavier: give me a children, I can't have them on my own, please help me to have them without having to go through in vitro, in Jesus Name,Amen. Saint Francis Xavier: Please pray for my brother and heal him from all his sicknesses physically and mentally, in Jesus Name, Amen. Help me always to be in a state of absolution and grace, and above all help me to have as much faith as you or GOD would like to see in me. Help me also to read the Lives of saints, and also to come to work in Europe, and also grant me the blessing to balance my works and support I need to provide to my family,and time I need to devote to my various duties, and also my various interests in Theology, Mathematics and so on. Also help me to read Abbot's book and Cantor and St Agustine, and do similar researches in subjects that might have interested you when you were in College. Also help me to understand your true opinion of other relegions. I felt confused, when I read the article about you, in Wikipedia, and I am sure, you definitely did consider, the miracles of very honourable Elijah of old testament, and also the fact that the mystery of Holy Trinity remained unsolved by St Agustine. Perhaps you had solved it. If you had'nt, then either a better approach about Indian relegions if they are related to any other manifestations of the Holy Trinity or an enforcement of your opinion over St Agustine's unsolved vulnerability to the first commandment has to be considered. And in heaven you know better than, us mortals on earth. But in the matters of first five commandments and if possible other commandments too, help me to be as perfect as you were, in your life time. Please shower your holy water on me,from heaven every day of my life. THERE DEATH,PLEASE RAISE MY SOUL AND MY AIMLESS POOR LIFE ALSO. St.Francis Xavier, pray for me so I may find a job. Thank you. , may God grant him many more years with us, thank you for listening and praying for me. thank you St. Francis for curing me of the problem of 65 years.I have no words. Just read the miracles you had done. Thanks for giving me a chance to read it. Please........help my niece DANNIELE FAYE MARIE ISON to recover for the state of health she is in right now...Please adopt her as yours and guide her through with her life. 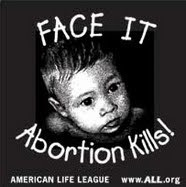 Please intercede for us, that her life will be spared and that she will live normally like other children. Lord the baby suffered enough and she is fighting to live, please help us PRAY FOR HER to our ALMIGHTY FATHER. Thank you ST FRANCIS XAVIER. Omy dear saint francis xavier ,please do interceed me for the prayers which i am placing before god . I do believe without any doubt that your intercession can get me the intentions which i ask to god almighty without and delay and failure. st francis do pray for me.praise to the lord almighty god. Glory to god in the heighest. St. francis cure my warts 23 years old and my evil afflictions.St. francis pray for me and my family , i am going to visit your body in Goa and get healed. Saint Francis, pray for a total healing for Rene Foo. He is suffering from Parkinson and knee degeneration. I believe in miracle. Thank you. please bring my son Paul sakal back to life I am going out of my mind the whole family is, I promise to give all of Paul's money to charity and the church. PLEASE HAVE FAITH..I SUDDENLY PASSED THIS SITE.I HAVE A RELIC OF ST F.XAVIER AND I ASSURE THAT YOUR SON IS IN SAFE HANDS...YOUR PRAYERS HAVE NOT GONE UNANSWERED AND WON FOR HIM ETERNITY...YOU UNDERSTAND ETERNAL JOY.SO DO NOT SORROW,BUT KEEP YOURSELF AT THE EUCHARISTIC FEET OF JESUS AND WITH THIS RELIC I SEND YOU MY PRAYERS.GOD LOVES YOU VERY MUCH. DEAR ANONYMOUS THANK YOU BUT YOU ARE NOT BRINGING ME ANY COMFORT OUR FAMILY MISSES PAUL FOR THE KINDNESS AND PEACE HE IS BRINGING ,HE IS OUR HOPE OUR FUTUR OUR SUPPORT OUR COMFORT IN THIS WORLD.ALL I WANT IS FOR HIM TO FINISH HIS LIFE CYCLE FORTY MORE YEARS HAVE A FAMILY CHILDREN AND THEN GOD CAN TAKE HIM BACK,I CAN'T GIVE UP ON PAUL WE NEED HIM IN THIS WORLD AND I WILL KEEP PRAYING FOR HIS RETURN, I HAVE FAITH AND TRUST IN GOD, JESUS, MARY AND ALL THE SAINTS, I KNOW IF I ASK AND PERSIST THEY WILL END UP ANSWERING MY PRAYER. In the same year that Martin Luther was preaching that Miracles had ceased in the Church age Francis xavier raised someone from the dead in front of thousands of witnesses! My husband has been cheating on me and beats me up when I question him. he humiliates me and calls me names in front of my two children. He uses our home to bring this women. He even raises his hands on my two children my son who is 27 and my daughter is 21. I m unable to forgive him for cheating and beating me mercilessly. He says he hates me in front of my children. Dear saint Francis Xavier my husband prays to you every morning. please heal him right now and pray for us we need him to a loving father and a loyal husband. Help me to forgive him. Saint Francis Xavier pray that I may be healed physically and mentally. Please I want to breath and sleep well again. Dearest St. Francis Xavier I pray that my youngest daughter and son-in-law may return to the Catholic faith and experience a life changing conversion experience . I also pray the same for my eldest daughter. I pray that they may find the peace that only God can give, I ask for your prayers & intercession as I believe you were able to convert thousands to Christ and know two more families would be a minisucule task for you for Our Lord. Thank you in advance St. Francis & keep watch over me and my family. I know it had been a while since you were on this site but I will pray for Paul to return to you. I am praying for my son Josh to return as well. I know he was taken before his time. The bible says heal the sick raise the dead. The bible says ask anything of the father in my name and you shall receive it. I will never stop praying for Josh to come back and I will pray for Paul as well. Dear St. Francis Xavier, Please pray that my son Sean comes back to the faith and that my husband convert. I also pray that I never lose hope and faith in our beautiful God who I love so much. Julie, God has answered you already. He has granted Paul eternal rest. You want Paul back for selfish reasons: so that YOU can have comfort, so that Paul can do YOUR job of supporting and helping the family, so that YOU can have grandchildren, etc. Not once did you mention Paul's happiness - you speak of Paul as if his sole purpose is to serve your family and take on the burden of the family's problems. The "life" you want him restored to is no life: it is servitude to your family's needs. Not even needs - you don't NEED to have grandchildren, for example. You speak as though God is Santa Claus: you hand him your wish list (you even presume to tell God exactly how many more years Paul should live!) and you think if you just promise to be good, then you should get what you want. Does that mean that all the other suffering people in the world were just not good enough, just didn't believe hard enough? God is not Santa Claus. God is our parent. Like any good parent, God is trying to guide you to be an adult. You leaned too much on Paul. That was not good for you. I know you are daunted by the task, but God wants YOU to step up and do your duty to your family. You say you are willing to serve God forever; well God is telling you that the way He wants you to serve is to do your family duty and not expect your son Paul to do it for you. Again, I know it is scary, but if you make the effort, then God will be there helping you every step. Once you stop arguing with God's decision and do the work He wants you to do, then you will find it rewarding beyond your dreams. Once you stop expecting Paul to solve your problems, once you work with God to solve your problems the right way, your whole family will be happier in this life, and you will be truly ready for the bigger life to come. Maybe that's why God took Paul - Paul had already demonstrated the character that you need to have, so Paul was ready for the bigger life beyond this one. I will pray for you to make that effort to do the right thing. I will pray for you to focus on the strength and inspiration to do what God wants. I will not pray to reverse God's will. Again, God has taken pity on Paul, and granted him eternal rest. Dear servant of god st Francis Xavier please ask god to raise my widowed sister's son name sudhakar 25yrs (DOB 28-03-1992 DOD 22-7-2016 friday 10 pm)addresss gollapalem vill, inkollu md prakasam dt andhra pradesh state,india country . we are eagerly awaiting for god's miracle in our life because it is just like act but for human beings is a micacle. please ask god to sent back my nephew for the extention of kingdom of god. Dear servant of God st Francis Xavier please ask God to raise my brother back to life, Dear Lord please bring my younger brother shakeel amjad back to life on earth and live with us as usual he was living, died last 22 days ago on Road accident as on 4 may 2017 he was just 22 years old. please bring my brother back in name of the Father and of the Son and of the Holy Spirit amen. with will of God amen. address Pakistan Lahore LDA quarters. Hello. I found this website while looking for quality information about people being raised from the dead. This is for an article series I am creating about people being raised from the dead around the world. And this is part of a larger series I work on about miracles, particularly modern miracles. The focus of this article here about Saint Francis Xavier helps to expand my mind about what is possible. And it also questions those who are Cessationists. I have found in my very basic online research that there are MANY stories of people being raised from the dead since the death of the last living Apostle (John), and that there are modern accounts of this mind-stretching miracle. Please let me know if anyone has encountered such miracles. Or any of your own experiences of miracles. Come over to our website, and use the email form, and we will publish your comments. Thank you. St. Francis Xavier please intercede for my mission here on earth that has been going on. I need your help to be able to obtain help in order to continue to propagate the Catholic Faith and conversion of sinners and the unbelievers.